This game reminds a lot of the SNK arcade classic "Samurai Shodown" ("sho-down", without a w!). You have a dozen of different fighters, each one with his or her own fighting style and abilities. Most of the fighters are girls, there are only two men. All the figures look a lot like characters from oddly known Manga and Anime series, like Ranma 1/2. 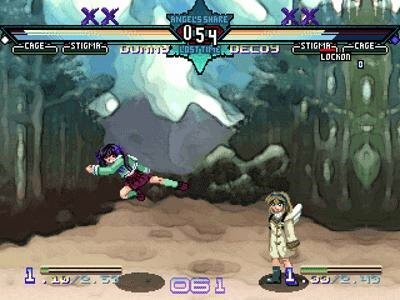 You can choose between a fireball-tossing angel, a cute schoolgirl with a dangerous scarf, a tall girl who likes to slash up her enemies with a long sword and many others. Unfortunately the characters have no voices, only different attacking sounds. But the graphics and the music are very nice. Another flaw is the fact that the game contains only one stage and some undone graphics. Probably the game hasn't been finished yet, so this might be a beta. But there's a program to manage stages and record replays, so I guess there must be some more stages to be downloaded and added. Would be nice, I like this game a lot and recommend it to anyone who likes the good ol' arcade beat'em up genre. 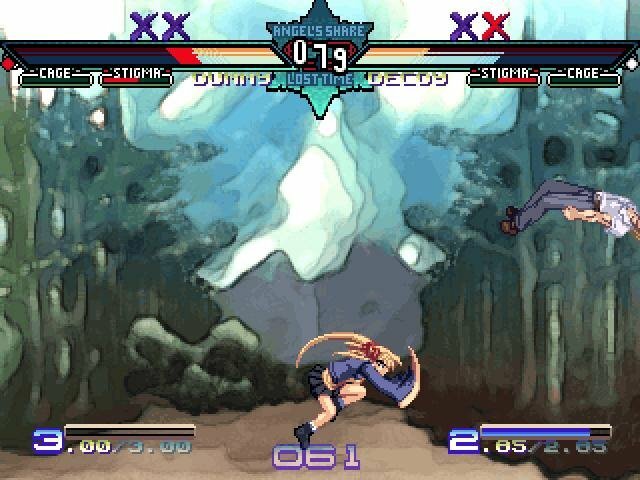 Dogma is really an excellent Japanese fighting game that is very similar to Street Fighter. There is a total of 9 players to choose from and four different modes of play. 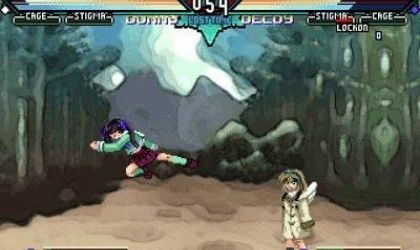 Sequence is the story mode where you battle your way through each player. In VS-User and VS-Comp mode you can either play against a computer player or a friend. Watch mode is for just watching the computer fight. The in-game story is all written in Japanese, but you don't really need to know whats going on in order to play. 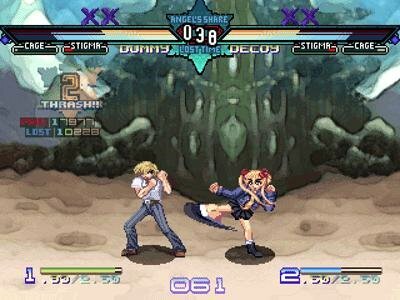 As with these fighting type games, each player has their own unique skills and special moves, and certain players have weapons as well. The graphics are a bit old school, but are still very crisp and clear and the gameplay is awesome. The controls make the game a bit hard to play but you will get used to it eventually. 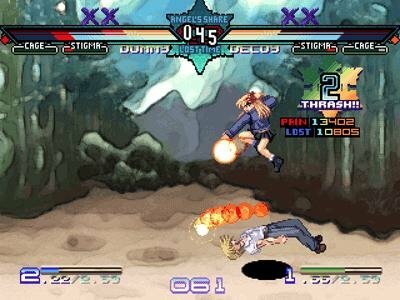 All in all this is a brilliant fighting game and is a must download for fighting fanatics. The most excellent fighting game ever played by me. 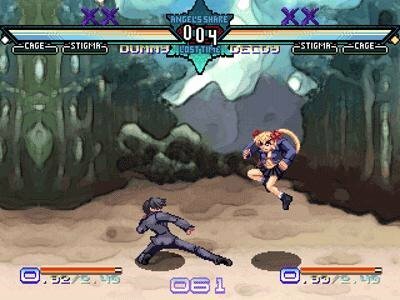 Most of the fighters are girls and this game contains anime graphics which I like. This game reminds me of Ranma 1/2. But it has also some disadvantages: first the game has no different backgrounds and the language a player says after winning is not understandable by me. But overall the game is really nice. 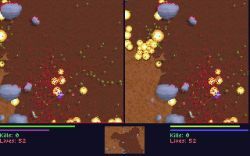 This game has the greatest gameplay for any freeware action game I've ever seen! It has extremely good special effects and is very fast paced to suit the needs of the player, altough the buttons are quite hard to get used to and there is no FAQ to explain anything. It's still worth the download! So DOWNLOAD IT NOW! 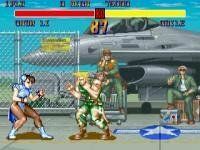 The gameplay is almost identical to Street Fighter 2, but very fun. The combos are good but not great, there are nice characters to choose from but not alot, but what else can you expect from a freeware game. Overall it is very fun and very challenging (in a good way). Download this game as soon a possible! Took a minute to learn the second player buttons... But it is an awesome game that I downloaded and it is already worth every single non-existent penny. It is very fun. I like the graphics and the game. You should try playing too. It rocks. It's the best game ever.